Hojicha Green Tea - A Prefect Decaffeinated ? Hojicha is created by roasting sencha or any other green tea, which gives it a distinctive roasted aroma. The process of making this tea is said to have been discovered in 1920 by a Japanese tea merchant looking for a way to get people to buy his excess inventory. Instead of steaming and roasting, tea leaves are fixated by pan-roasting at 200 degree Celsius and then immediately cooled. Instead of having sencha's emerald color and strong green flavor, the resulting brew is chestnut brown with a toasted aroma, and a clear, light taste. If you are a black tea drinker looking for a way to enjoy green tea, then you will like the taste! Have you ever given a small child a cup of coffee? As long as it is not your child, it is a great deal of fun - just stand back and watch the chaos! Caffeine can make even well-behaved children bounce off the walls! In Japan, hojicha is said to be suitable for children and the elderly to drink because it is low in caffeine. Through high temperature roasting, caffeine is changed directly from solid to gas. It is also a good choice as a late evening drink as it is unlikely to cause sleeping problems. However, the same process that removes the caffeine also reduces the antioxidants. So there will be fewer health benefits. O-Cha's organic hojicha green tea is a great place to start. While much of this type of tea is made from bancha (a low grade harvest later in the year), this tea from O-Cha is made from first-harvest sencha leaves. 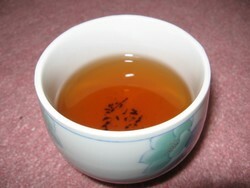 The tea is brownish-green in color and quite fragrant. The aroma reminded me of caramel, perhaps even with a hint of bittersweet chocolate. The flavor was smooth, nutty and toasty without being bitter. That said, I enjoyed their sencha and gyokuro more. However, that may have been simply personal preference. I would definitely prefer it as a night cap, as sencha is more caffeinated!